Sherri Melson – Sherri is head coach and program director of Flyers Gymnastics. She is a former USAG competitive gymnast who brings 30 plus years of coaching experience and education to Flyers Gymnastics. Her coaching career has spanned all age ranges and experience levels, from pre-school to competitive team gymnastics. Sherri is a USAG Professional Member with a safety certification, instructor certification, and USAG approved back ground check. She is also CPR & first aid certified. Marissa Miller – Marissa is our head Coach for Optionals, & Xcel. She also is in charge of our Little Flyer program. Her coaching career has spanned all age ranges of experience level. Marissa is a USAG professional member with a safety certification, instructor certification, and a USAG approved back ground check. She is also CPR & first aid certified. Marissa has been coaching at Flyers for the last 10-plus years. She is a former USAG optional competitive gymnast. 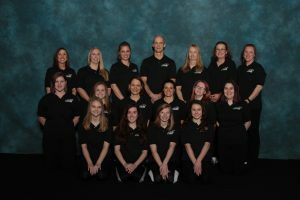 Erin Sleasman – Erin is our staff manager, head Xcel Silver & Gold coach, daytime classes coach and also coaches instructional classes. Her coaching career has spanned all age ranges of experience level. Erin is a USAG professional member with a safety certification, instructor certification, and a USAG approved back ground check. She is CPR & First aid certified. Erin is a member of the NAWGJ and holds a certification to judge gymnastics through level 8. Erin has been coaching at Flyers for the last 9 years and is a former USAG competitive gymnast. Erin has her B.S. in Communications: Media Management. Kelsey Smith – Kelsey is an Instructional class coach & an assistant team coach, and this is her 4th year coaching at Flyers. Kelsey is a USAG professional member with a safety certification, instructor certification, and a USAG approved back ground check. She is CPR & First aid certified. Kelsey participated on our Flyer’s competitive team until she graduated. This year Kelsey is a Sophomore at Jamestown Community College and is pursuing a degree in Accounting. Emily Pfleuger – Emily is an Instructional class coach and this is her 3rd year coaching at Flyers. Emily was a competitive gymnast at Flyers for 10 years and is a USAG instructional member with a Safety Certification, and instructor Certification. Emily is CPR & First aid certified. Emily is a Senior at Pine Valley Central School and participates in volleyball. Melissa Barber – Melissa is, our Flyers Elite coach, Flyer’s team manager and an Instructional class coach and this is her 4th year coaching at Flyers. Melissa is USAG professional member, with a safety certification, instructor certification, and a USAG approved background check. Melissa is CPR & First Aid Certified. Melissa is a certified Elementary school teacher with a masters degree in education. Brian Pumford– Brian is the program director for the boys program at Flyers, Team Flyers conditioning coach, and an instructional class coach. Brian has been coaching with Flyers for 6 years. Brian is a USAG Instructional member with a safety certification, instructor certification, and a USAG approved back ground check. Brian is CPR & First aid certified. Brian has a masters degree in Social work. Elizabeth Fessel – Liz is an assistant coach and this is her third year coaching at Flyers. Liz is a former competitive gymnast and is a USAG Professional member, with a safety certification, Instructional Certification, and has a USAG approved background check. She is also CPR and First Aid Certified. Liz attended Keuka college and has a degree in Occupational Therapy. Keeley McWilliams –Keeley is an instructional coach, and this is her first year back coaching at Flyers. Keeley is working on her USAG Instructional member with a safety certification, instructional certification, and is CPR and First Aid certified. Keeley competed for Team Flyers for 6 years and is on the prestigious wall of graduating competitive seniors at the gym. Keeley also works full time as a CNA. Mara Marsh – Mara is an Instructional Class coach and this is her third year coaching at Flyers. Mara is a USAG Instructional member and is Instructor certified, and CPR & First Aid certified. Mara has been a Flyers Competitive gymnast for 6 years. Mara is a Senior at Randolph Central and is involved in dance. Fawn Schuster – Fawn is our team ballet instructor and choreographer. 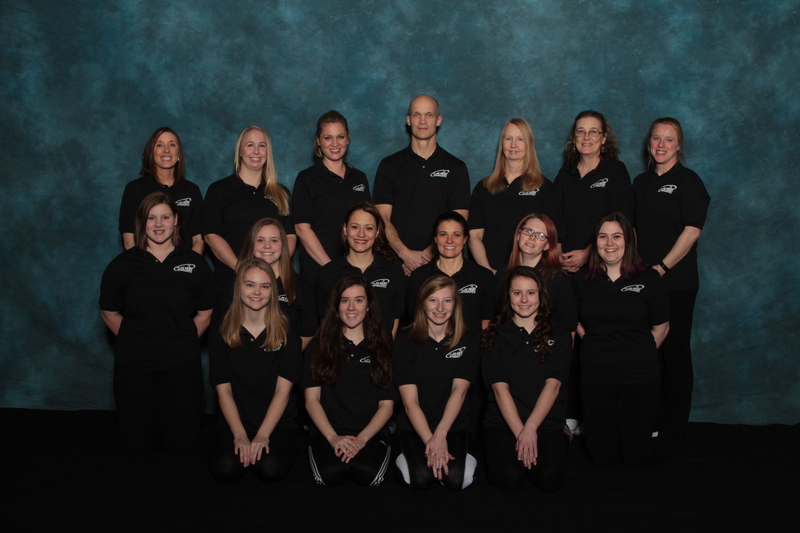 This is Fawn’s 8th year teaching ballet at Flyers. Fawn has been teaching ballet and private lessons for 16 years. She began her 30 years of dance experience with the Jamestown Civic Ballet Company under the direction of Ms. Shirley Kopp. Fawn is trained in the Cecchetti and Vaganova ballet techniques. She danced in the Nutcracker with Empire State Ballet for 3 years with Beth Elkins and Harris N. Ferris, current Director of the Pittsburgh Ballet Theatre. Fawn has also danced with the Lake Erie Ballet and taken multiple master classes from various professional dancers. Rhonda Haick– Rhonda is a receptionist and book keeper and this is her 3rd year with Flyers Gymnsatics. Rhonda is CPR & First Aid certified. Outside of Flyers Rhonda is the owner of Lee’s Book Keeping Service established in 2005. She has 19 years experience as a tax professional. Autumn Thompson– Autumn is a receptionist, instructional class coach, and special needs instructor. This is her second year with Flyers Gymnastics. Autumn is CPR & First Aid certified. Outside of Flyers Autumn is self employed as a child care provider and minister. Samantha Gilbert– Sam is an instructional class coach. This is her first year of coaching. Sam has a USAG athlete membership and is a current competitive Gymnast her at Flyers competing as a level 9. Sam is a freshman at Falconer Central School and participates in Track. Halle Nelsen– Halle is an instructional class coach and this is her second year at Flyers. Halle is a former Flyers gymnast and currently participates in karate.